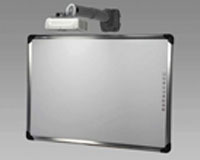 iBoard Interactive Whiteboard system consists of a computer, a projector and Interactive whiteboard. The Interactive White Board gets access to a normal computer through a USB cable, and the projector connects with the computer(laptop / desktop PC) through a VGA cable. After calibration, touch and tracking information from the board will be transferred into pointer click and movement of the mouse, and by software all click, tracking and writing information will be displayed on the board at real time.